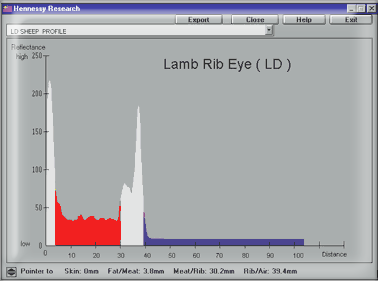 In 1998, Hennessy technology developed a lamb grading probe to objectively measure carcass lean meat yield. Since that time Hennessy technology has been able to configured to accurately grade lamb carcasses for % lean meat yield along with objective meat quality traits. Essential to obtaining optimum results is the need to use probe guidance technology, because human operators without objective guidance technology cannot insert and remove Hennessy probe needles in the correct carcass site at the correct angle, as well as removing the needle precisely along the same axis. Collecting Hennessy technology results without the correct associated technology is a waste of time and money. For yield measurement it is only necessary to probe each lamb or sheep carcass in a single specified site. It is highly recommended that measurements should be made using a Hennessy guidance mechanism allied with a carcass support cradle. To ensure that insertion and withdrawal by the operator occurs in the same coordinate plane. The natural flexibility inherent in a lamb carcass will cause difficulty when measuring unsupported carcasses. Again specific animal Interface recognition software has to be specially tailored to this animal type. Of course for those that want to measure more than one site. Two or more sites can be measured. It just takes a little longer. 2. Lamb Quality and Cutability Assessment. 3.D.E. Burson, T.H.Doane. " Yield Grades and Quality Grades for Lamb Carcasses ; G83-675-A. 5. E.P. Berg, M.K.Neary, J.C. Forrest, D.L. Thomas, R.G. Kauffman. "Evaluation of Electronic Technology to Assess Lamb Carcass Composition". Journal of Animal Science, 75:2433-2444, 1997. 6. D.L. Hopkins, N.M. Fogarty & B.A. MacDonald. " Prediction of Lamb Carcass Yield using Video Image Analysis. Proc. 43rd ICOMST, pp234-235 , Auckland , NZ, 1997. 7. A.R.Bray, S.M.Francis, D. O'Connell, R.Bickerstaffe. " Lambs selected for fast glucose clearance have high meat pH levels when stressed for slaughter". NZSAP 1992 Proceedings : Abstract AB92014.